"Will Leviton #4 of the Rhode Island Rams is held up by teammates Michael Tertsea #55 (L) and Eric Dadika #15 after a point against the Virginia Commonwealth Rams during the first half in the Quarterfinals of the Atlantic 10 Basketball Tournament at Capital One Arena on March 9, 2018 in Washington, DC." One of the best things about March is basketball. With March Madness taking over the sports news cycle every year, the stories always inspire great competition. And while that starts on the court, to me the best visuals always come from the bench. Players are always showing their support for their teammates which is uplifting in it self - a pick me up if you will. Their actions and celebrations are always over the top. 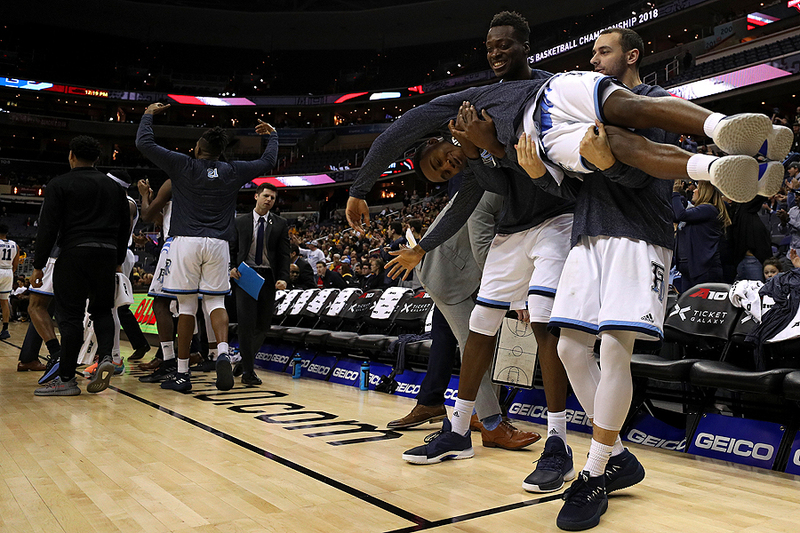 During the Atlantic 10 Basketball Tournament the end of the Rhode Island Rams bench was nothing short of entertainment. With every three-pointer, block, turn-over and dunk, they lit up in jubilation with eccentric routines. Sadly for all with eyes on them, they didn't win the over all tournament because I don't doubt it would have been even crazier had they taken home the title.